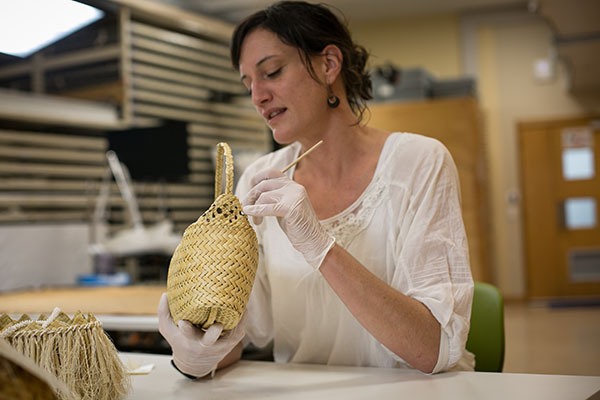 The Te Awe team is made up of Collection Technicians, Conservators, Storage Technicians and a dedicated photographer who care for the incredible variety of taonga Māori housed in the Museum. Kia ora! I came to Aotearoa in 2014. Back then I was privileged to become part of the previous project mainly looking after Māori carvings. My studies and most of my working life I spent in the area of Frankfurt and Cologne, Germany, where I am originally from. I specialise in objects and organic materials. It is very special and rewarding to take care of the taonga Māori Collection alongside the team and knowing the collection will be more accessible in the future. I have the unique privilege of focusing the majority of my time on taonga Māori as a photographer for both the Collection Imaging and Te Awe teams. 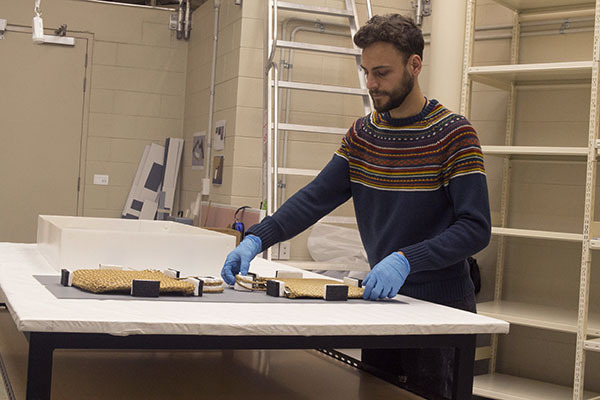 The collections photography team at the Museum works to exacting technical standards. 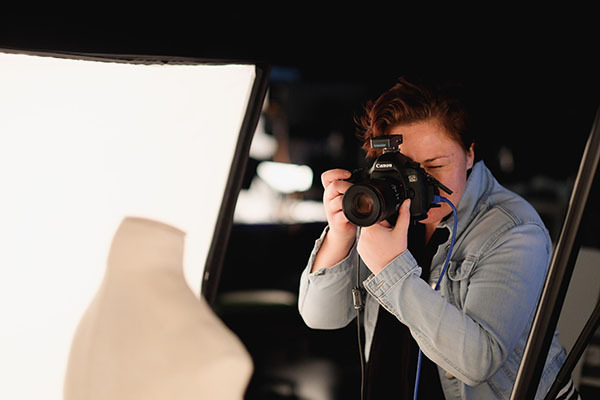 The specifications include professional studio lighting, accurate representation of the taonga, zero post production and comprehensive archival formats to ensure the best possible guardianship of our digital collections from future technological changes. I consider it an honour as Maori to work so closely with Taonga tuku iho, being able to operate within the framework of Maoritanga while still upholding museum art aesthetics to showcase the craftsmanship of each object; and help tell the objects' stories through our online platforms. I’ve always been a maker and appreciator of textiles and fibre arts since I was young, and thankfully get to see and care for some beautiful examples in this project. After growing up in Tāmaki Makaurau, I gained a BSc in Clothing and Textile Sciences at the University of Otago. From there I went on to an MPhil in Textile Conservation at the University of Glasgow, in Scotland. Since then I have travelled and interned or worked in different museums across the world, including the Royal BC Museum (Canada), Smithsonian’s National Museum of the American Indian (Washington, DC), and Te Papa Tongarewa. To care for taonga, the physical and intangible, the past and present, nga taonga a nga tūpuna, is a great honour and responsibility. Ko Charlie ahau, ko Basingstoke ki Ingarangi te kāinga. I have been living in Aotearoa since 2015 and started working at Tāmaki Paenga Hira in 2016. I studied Fine Art in Cardiff, Wales, specialising in sculpture. Between my degree and working for various production companies, I have learnt a broad range of fabrication processes which have been built on in my time here at the Museum. It is an honour to be working so closely with the taonga on this project, and a real privilege to get an idea of how these amazing artefacts were created. Nā reira tēnā koutou katoa. Tēnā koe! Ko Justine tōku ingoa. I have lived in Tāmaki Makaurau my whole life, and studied Art History, Archaeology and Museums and Cultural Heritage. Following my studies I travelled Aotearoa visiting and assisting local museums as a researcher on the TV series Heritage Rescue. My passion in studies and mahi is weaving and textiles, so it is wonderful to spend time with these taonga and the skilled Te Awe rōpū. It’s an honour to get to know the taonga so closely and learn from them as we work to improve accessibility. I’m looking forward to helping whānau, researchers and visitors encounter and learn more about these taonga too. Haigh. Tháinig mé anseo i 2016 as Éireann agus mé ag obair le bailiúcháin Māori ó am shin. Rinne mé mo staidéar fochéimithe ar Stair na hEalaíne sa Ollscoil na hÉireann, Corcaigh agus tar éis sinn d’fhreastail mé Ollscoil Lincoln i Sasana chun Céim Mháistir Caomhnú Ealaíne a dhéanamh. I ndiaidh sinn bhí mé ag obair mar caomhnóir ag cúpla músaeim (Músaem Pitt Rivers, Oxford agus an Músaem Seandálaíocht agus Antraipeolaíocht, Cambridge). Ansin, bhí an t-ádh liom mar fuair mé an post seo. Is mór an pribhléid dom a bheith i mo bhall de tionscnamh tábhachtach seo agus mé ag freastáil mar kaitiaki do na taonga galánta seo. Hi. 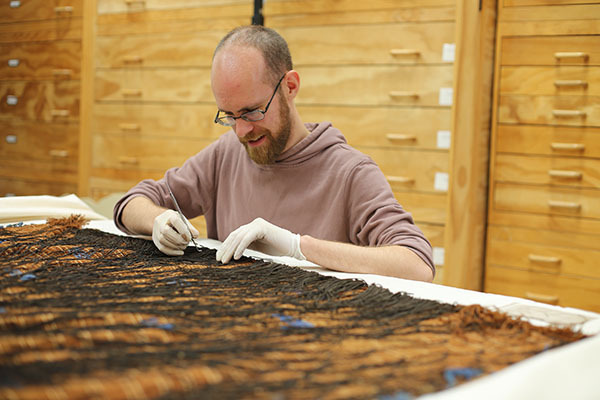 I came to New Zealand from Ireland in 2016 and have been working with Māori collections ever since. My undergraduate degree was in History of Art, studying at University College Cork, Ireland. After that, I attended the University of Lincoln in the UK, obtaining a Masters’ degree in the Conservation of Historic Objects. Once I’d finished my studies, I worked in a couple of museums in England (Pitt Rivers Museum in Oxford and the Museum of Archaeology and Anthropology in Cambridge). Then I was lucky enough to find this job. It is a great privilege to work on this project and to serve as kaitiaki to these taonga. 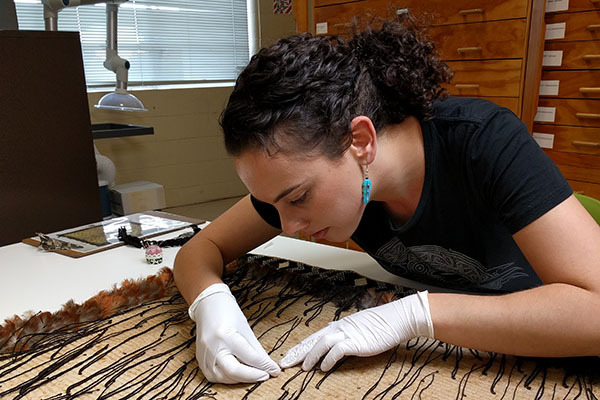 As a Collection Technician for Te Awe, I am involved in describing Māori textiles based on Māori customary terminology and classification systems. My passions are Māori weaving and archaeology, and I obtained an MA after researching archaeological textiles held in Tāmaki Paenga Hira. I have 30 years’ experience as a kai raranga and eight years as an archaeologist. It is a great privilege to be spending time with these amazing textiles, and I am looking forward to our continuing journey.